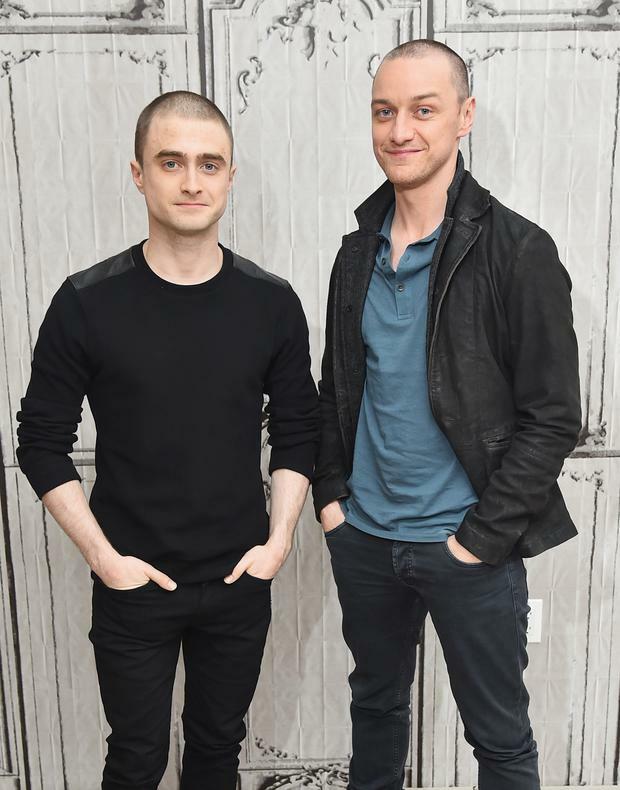 Daniel Radcliffe is sporting a startling new look - a buzz cut. He admits he wasn't sure on the severe look initially but "loves it" now, as do the fans who've taken to social media in their droves to share their approval. His hair, it transpires, was shaved off for his role as a neo-Nazi in Imperium, due out next year, but it wasn't just the shorn head that caused concern for the star - the title has too. "Imperium - it sounds too much like a Harry Potter spell," Radcliffe teases, eyes glinting. At 26, the boy wizard may be all grown-up, but that doesn't mean he isn't still haunted by his most famous role. "Whenever I try on glasses for a part, I'm always like, 'No, get ones that are less similar'," he says, referring to his former big-screen alter ego's circular specs. James McAvoy, his co-star in new movie Victor Frankenstein, doesn't share Radcliffe's Potter spell concerns, but tells him the title reminds him of 2002 sci-fi flick Equilibrium. "I auditioned for that when I was nine," informs Radcliffe. "For the part of Christian Bale's son, and if I'd got it, I wouldn't have been able to do Potter, so thank God I was s**t that day." He and McAvoy make for easy company and their chemistry has transferred to the big screen in Victor Frankenstein, a twist on Mary Shelley's legendary 1818 novel. It seems a shame that it's taken this long for the pair to unite on a project. "We weren't avoiding it. I think this is the first opportunity to work together," says Radcliffe. "I'd already read the script when James' name came up. It was very much one of those reactions of, 'Yeah, but will we get him?'. I thought he might be doing X-Men." This is news to 36-year-old McAvoy. "It was quite easy [for me]. As soon as they offered it to me, I was like, 'Yep'," the Scot reveals. In the movie, he plays the radical scientist Frankenstein, a name often mistakenly attributed to the monster instead of its creator. It's on a visit to the circus that Frankenstein witnesses a hunchbacked clown [Radcliffe] perform an emergency procedure on a fellow performer, played by Jessica Brown Findlay, and impressed by his knowledge of anatomy, which has been self-taught, saves him from his life of squalor, relieves him of his deformity, and gives him the name Igor Strausman. "Igor has a very rich, intellectual life, and if he's not the academic equal of Victor, he's certainly a partner in terms of what they're creating," explains Radcliffe. Paul McGuigan, the director - who's also helmed episodes of Sherlock Holmes - has noted that it's very much a platonic love story between the two men, and McAvoy agrees. "It's about two people who've been absolutely isolated, one self-imposed and the other one that's had it beaten into him and treated more like a beast than a man, and yet they have a commonality," says the actor. The movie might have maintained the novel's original Victorian setting, but Radcliffe notes that he doesn't "think of it as a period film, but as being completely modern". "Victor and Igor have cutting-edge ideas; they're the tip of the spear. They view science as being more than just observational," he says. "They believe it could be creative and re-shape the world." Just because they discover they can cheat death though, should they? "I think Victor's intentions are good," reasons McAcvoy. "He's looking to improve the human condition, which is very fragile. "Victor is trying to make it more robust and, ideally, eliminate death, which has been a human obsession for ages." Radcliffe, meanwhile, appreciates "there are always ethical issues" relating to the advancement of science. "You can't just do insane and awful things to people in the name of science. But generally speaking, you can't really research too much, you can only apply it too much." McAvoy's five-year-old son Brendan turned up on set, but wasn't overwhelmed by meeting Harry Potter in the flesh - because he hasn't been introduced to that world yet. "He's too young and there's a lot of death and killing and loss and grief. I would suggest it's for a wee bit older," says McAvoy, who married his Shameless co-star Anne-Marie Duff in 2006. Duff recently starred in Suffragette and has spoken passionately about women's rights, while McAvoy's X-Men colleague Jennifer Lawrence made headlines when she revealed that her male American Hustle co-stars were paid more than her. One of the men in question, Bradley Cooper, has reportedly said he'd be willing to divulge his wage if it would help his female counterparts. "There's definitely an issue and maybe it would get helped by everybody just outing what they earn, but I don't want to start putting figures on actors' heads, because it's not what we do," says McAvoy in response to the debate. "What I find weird about the whole American Hustle thing was Jen, rightly so, was aggrieved that she was paid less, but it's even more shocking that Amy Adams [was]," Radcliffe chips in. "Because she's better than them, do you know what I mean?" adds McAvoy with a laugh. "I'm only joking. But she is." "The fact that the boys were on one deal and the girls were on another deal was weird," continues Radcliffe. "What guy, sitting in a studio somewhere, was going, 'Hey, let's bill the girls out of some money, that's where we can save a few'. "The fact that mentality still exists is slightly shocking to me and as a very liberal, progressive industry, we need to, pardon my language, sort that s**t out."